Honestly, if the whole of today is dedicated to Senator Dino Melaye it's not too much. The Senator already knew what he was coming with when he resumed at the Senate today. He knew he was coming to give Nigerians a shocker! 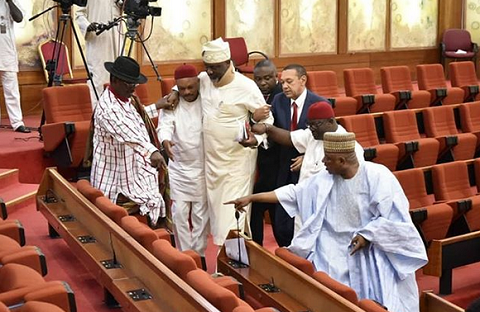 He got to the floor and made it clear, I AM SITTING WITH PDP SENATORS, lool. And the delighted Senators where so happy to help him move to his seat. Spot Ben Bruce who said yesterday that he would be willing to help Dino move around if he can't? Well Bruce kept to his words. LOL. If only every tribe can genuinely love like this with nothing attached, LOL. Oh dear, POLITICS!! !